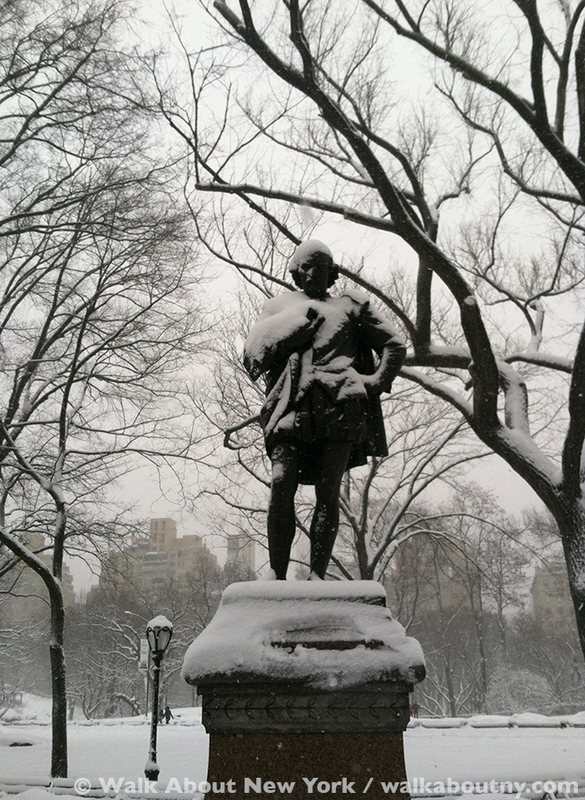 “William Shakespeare” by J.Q.A. Ward in Central Park. Did the author of those lines, William Shakespeare (1564–1616), whose birthday we celebrate today, have thoughts of immortality? There can be little doubt that his dramas, comedies, histories, and sonnets have brought him world renown across centuries. 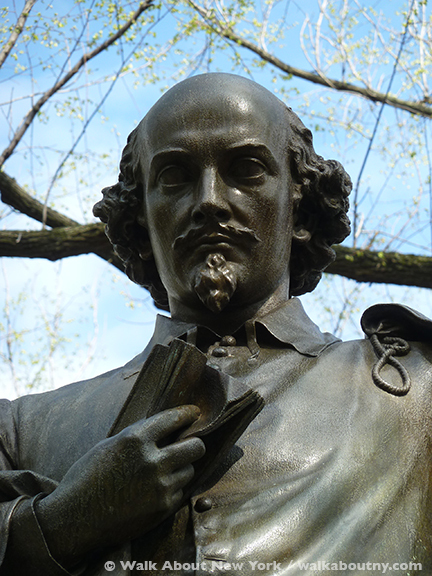 “William Shakespeare,” detail, by J.Q.A. Ward in Central Park. 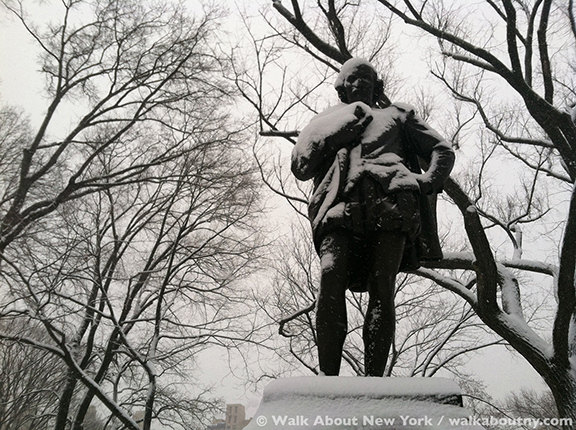 The southern end of The Mall in Central Park is informally known as Literary Walk. The most deserving person to stand in that area is William Shakespeare. 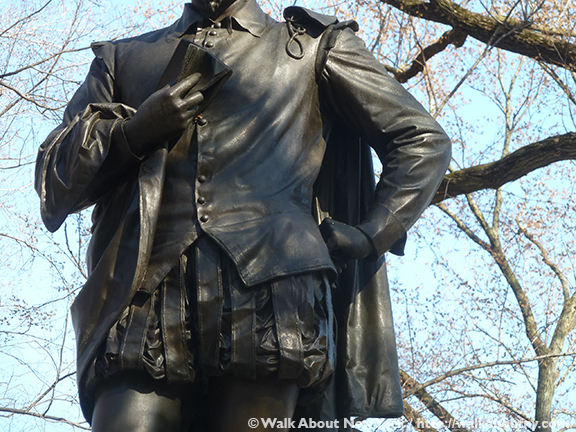 Born in Stratford-on-Avon, England in April of 1564, William Shakespeare’s birth records do not exist. The 23rd is accepted as his birth date because it was customary at the time to christen a baby three days after birth. The church where his baptism was held has the record of his christening dated April 26th. By coincidence the Bard died on the same date, the 23rd of April, 1616. In 1864 Edwin Booth (1833–1893), other actors and theater managers wanted to mark the 300th anniversary of Shakespeare’s birth. Permission was granted by the Board of Commissioners of Central Park to lay the cornerstone for a statue. Because the Civil War consumed the country, and funds were scarce because of it, nothing more was done until the war ended. 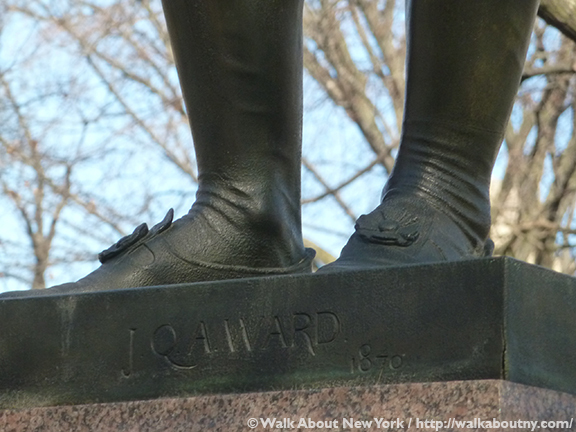 In 1866 a competition was held to design a statue of Shakespeare; the man who would come to be known as the Dean of American Sculptors, John Quincy Adams Ward (1830–1910) won the prestigious commission. To raise part of the funding for the sculpture Edwin Booth, along with his brothers Junius Brutus Booth, Jr. and the infamous John Wilkes Booth, staged a benefit performance of “Julius Caesar” at New York’s Winter Garden Theater. Their efforts brought in $4,000. 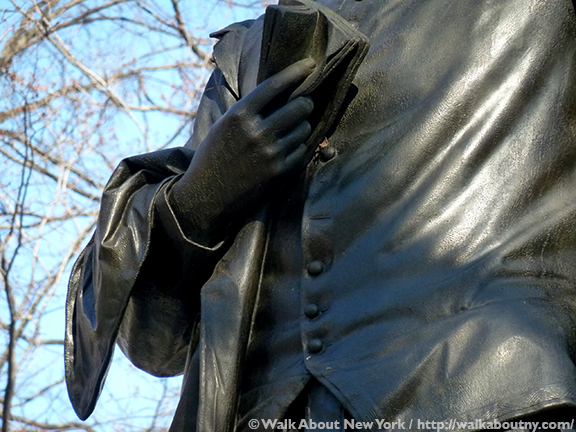 Jacob Wrey Mould (1825–1886), who designed bridges and other structures within Central Park, designed the elaborate pedestal for the bronze figure. 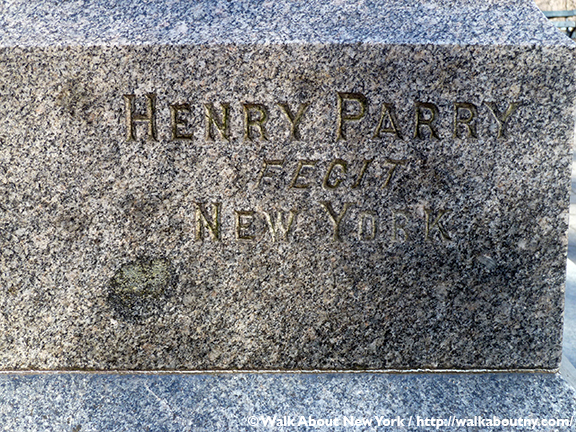 Made of Western and Rockport granite the pedestal was carved in Scotland. 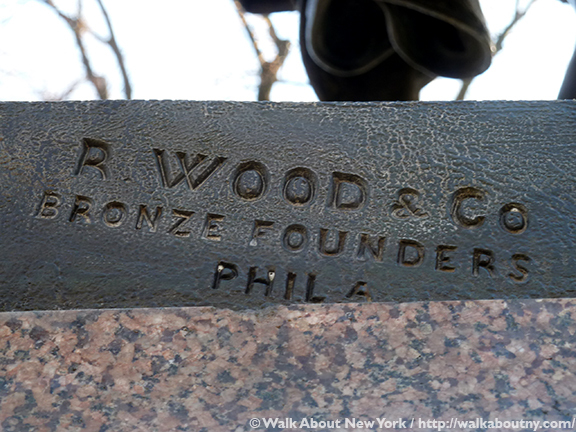 A Philadelphia foundry, the Robert Wood & Co., cast the sculpture in 1870. Contemporary critics found the work by turns a noble figure or a costume piece. 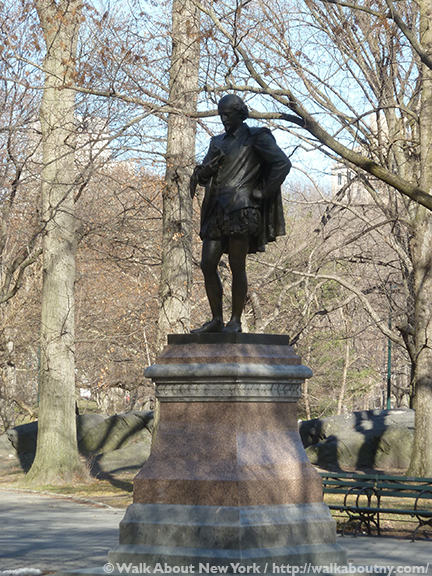 Central Park has other associations with Shakespeare. Because starlings are mentioned in Shakespeare’s plays, in 1890 Eugene Schieffelin (1827–1906), an American zoologist, released 80 of the birds into the park. 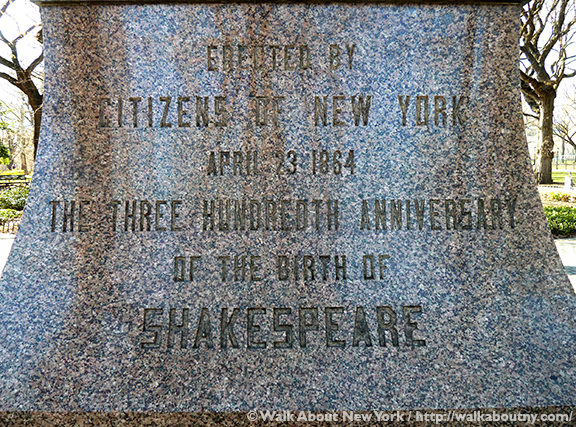 The Shakespeare Garden, featuring plants and flowers mentioned in the dramatist’s works, is located on the hillside between the Park’s Belvedere Castle and the Swedish Cottage, near West 79th Street. 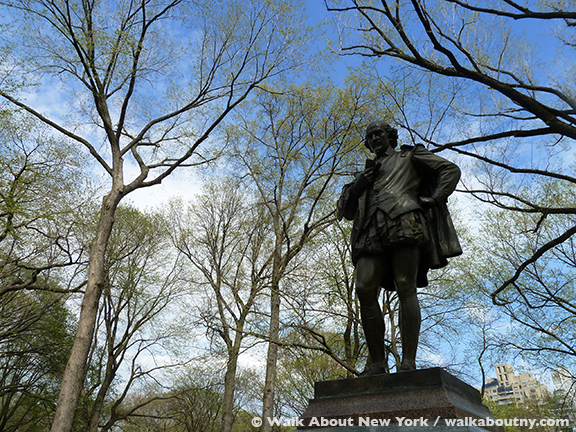 In 1958 the Shakespeare Festival, founded and directed by Joseph Papp, moved to Central Park. Four years later the Festival got a permanent performance space when George Delacorte donated money to build the Delacorte Theater. Shakespeare’s father John, a glove-maker and commodities trader, became a prominent local alderman and bailiff before seeing a reversal of fortune. Mary Arden, his mother, came from a well-to-do landowning family. Shakespeare is thought to have been schooled locally at the King Edward VI School, where Latin, Greek, and Roman dramatists were part of the curriculum. Shakespeare married Anne Hathaway in 1582. Their eldest child was a daughter, named Susanna; then came twins, Judith and Hamnet, who died in boyhood. Playwright Robert Greene, a competitor to the Bard from Stratford-on-Avon, first made mention of Shakespeare’s professional success in 1592; it was in his book, “A Groats-Worth of Witte,” where the up-and-coming actor and dramatist was referred to as “an upstart crow, beautified with our feathers … .” The Chamberlain’s Men, which changed its name to the King’s Men in 1603, listed Shakespeare as a charter member in 1594. The company primarily performed at London’s Globe Theater, where Shakespeare held a one-tenth interest. This was where many of his plays were performed before the theater was destroyed by fire in 1613 during a production of his history play, “Henry VIII.” Shakespeare retired to Stratford-on-Avon around this time. For being a modestly educated man he was quite prolific, leaving an indelible mark on the English language and Western culture. In a career spanning 25 years he penned 13 comedies, 13 historical dramas, six tragedies, four tragic comedies and 154 sonnets. Still today his plays are produced—on stage and film—worldwide. Read other articles connected with William Shakespeare. 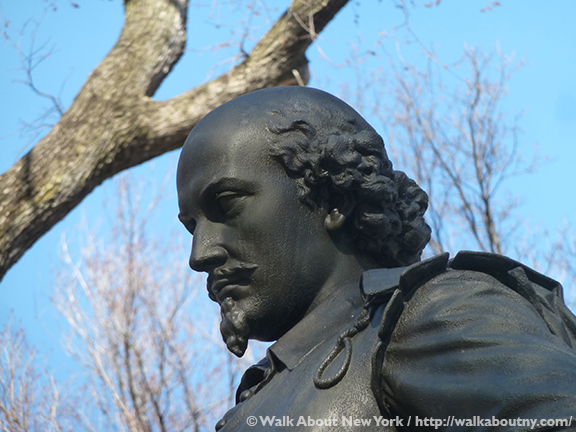 When you are part of our Central Park Walking Tour you will meet bronze William Shakespeare face-to-face. Take the Tour; Know More!